THIS IS THE BEST THING VER FOOL OF AWESOEM WAND WINNESTED!!!! Lol, the losers got training wheels. They see me rollin’ they hatin’. That thing would fall over without the balance wheels. So if it has four wheels, does that mean its not a motorcycle, and actually a car? In which case its probably breaking all kinds of laws? And also, tractor wheels are ugly? 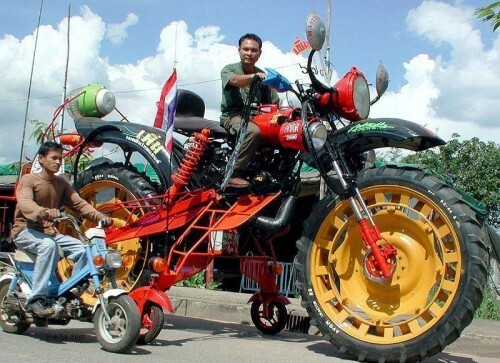 4 wheels = ATV Motorcycle. But not with training wheels. That’s the second biggest motorcycle I’ve ever seen. At a max speed of 20mph, I doubt if it will take off. Nope, I doubt this is taking off. I also wonder who he expects to see behind him with those rear view mirrors up so high.